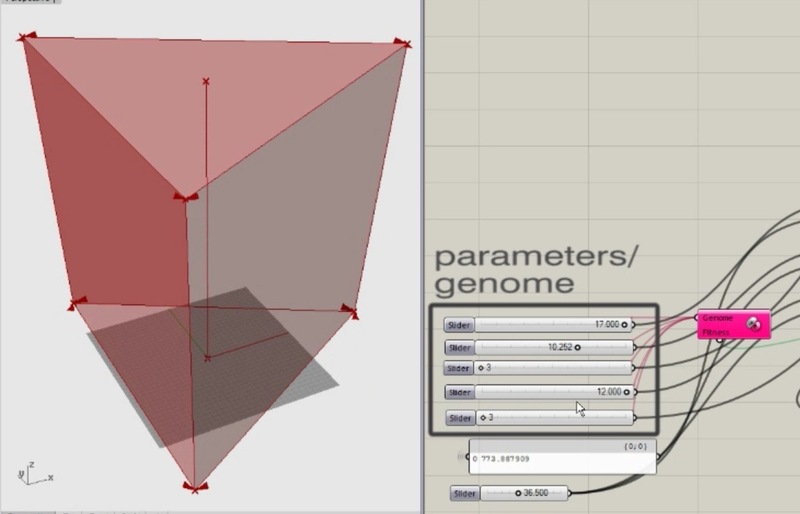 Galapagos is a component inside of grasshopper that can optimize a shape so that it best achieves a user defined goal. For this to work, Galapagos needs a series of options or genes to try out, and a defined goal or fitness value. In the POC video mentioned above, there are 5 genes that are used to generate an object. These are 5 numerical values within a given range that Galapagos can try in various combinations. Each combination, or genome, produces a unique object. The goal or fitness is defined as the lowest value of total solar radiation measured on the object’s surface. What makes Galapagos special is that it does not try every single possible combination of these options in order to arrive at the optimum solution. It can do this accurately in much less time by “learning” from each successive round of experiments or generations and progressively closing in on the best answer. In practice this means the difference between a week long calculation and one that can be completed overnight. Up until now, all of our optimizations use Galapagos as the solver, however there are plenty of other tools out there. Goat and Octopus are two others that are available as components inside the Grasshopper environment. Using Galapagos to solve simple scenarios with only a few variables is unlikely to produce a surprising result. Things get more interesting when we look at specific multi-variable problems that are not easy to visualize or solve quickly. For example, when relevant building configurations are tested on a specific site while considering nearby buildings and specific weather data or view rankings. The key to getting good results is in how the problem is formulated. “Ask a stupid question and you’ll get a stupid answer” applies especially well with Galapagos. There are essentially two parts to setting up a Galapagos simulation: the gene pool and the fitness. The genes are the numerical values that Galapagos will try out in order to produce the various scenarios it will study.The fitness is the “score” by which Galapagos will rank each configuration. In the example below, 4 genes are used to generate a four sided building footprint of constant area which is then extruded and tested for incident solar radiation with DIVA, an environmental analysis tool. DIVA calculates the total cumulative solar radiation and sends this value to Galapagos, which uses it as the fitness to rank each configuration. The results show that the optimum floor plate for the building is nearly square in shape with the slightly larger facades oriented directly toward due north and south. We get this fairly generic result because the massing configurations being tested are limited. The building cannot move about the site and the shape is always based on a simple extrusion. The next video shows the same experiment only now the building can be located in various locations on the site. In this simulation, orientation is no longer as dominant. Instead a compact mass that is positioned in the shadow of the existing building to the south is optimal. The comparison illustrates the quality of information that can be generated by manipulating the gene pool. The fitness value is the second part of the Galapagos equation. All of the experiments shown here are ranked by a fitness value that results directly from a single calculation such as solar radiation or view quality. However we could use the fitness value to penalize Galapagos for testing configurations that are less relevant such as footprints that are outside of a given site area or buildings that are too narrow. The amount subtracted or added to the fitness could also be variable and would need to be tuned so that it does not overpower other factors. The final video shows the Galapagos editor at work during a calculation. The graph at the top of the editor shows the optimization as it progresses through multiple generations. Optimal configuration are marked as the results are improved. The two charts on the lower right and middle of the Galapagos editor show convergence of the genes towards optimal configurations and the graphic on the lower right is a representation of each genome tested where each gene is represented as a green band. Really cool idea. Any way you could share your grasshopper script for the final iteration? I’m curious to see what parameters you used for the genomes. I’m working on a new post that explains the optimization process. I plan to include the script along with some instructions on how to use it. Should be up sometime next week. Thanks for reading! Take a look at the latest entry. We posted a link to the Gh definition and explained how to use it. Did you ever have a chance to include the script and instructions on the process you used, I can’t seem to find it. I am a graduate architecture student working to optimize my project based off of solar radiation and any precedents would be a huge help!! Yes! Check out the latest blog entry for the details. interesting work ! i checked the script but i couldn’t find the part how you could fit optimization inside a boundary or site plan for the towers that the optimization can’t go out of boundary polygon ? Hi Armin – that’s what step one is all about. The footprint component I included is pretty generic. It’s only constrained by area. One strategy we use when there is a site boundary is divide the site footprint into quadrants and then randomly place a point in each. These points are connected to form a polygon. The last step is to scale the polygon to a prescribed area so that you’re comparing apples to apples. Hope that helps. This is fantastic – thanks so much for including the gh script. I’ve had a play around with this and have tried to script something similar to the view optimization project for my thesis. Unfortunately I haven’t been successful with it. I was wondering if you would be able to give any insight as to how I might go about creating something like this, or alternatively have an exemplar/tutorial I could follow?